I have been shopping our pantry and freezer the last couple of weeks. Every 2 or 3 months I notice all the food bits that we have leftover such as half packages of pasta, condiments, half jars of olives etc. Then I make an effort to use as much as I can of everything before doing another large grocery trip. My pantry and freezer have had enough 'bits' of things to last me two weeks with another week or more of meals to go. We routinely eat leftovers, but the little portions of things I have to make an effort to go back and use every couple of months. So I have had a number of recipe experiments, most of which have gone well, a few not so much. Today my youngest son really wanted to eat the bananas he found at the store last weekend, but the heat had already gotten to them and they had turned brown. So it was muffin time again. Today I made a new recipe for Banana Crumb Muffins from Allrecipes.com. This recipe has 12 ingredients. It takes 35 minutes of total time, 15 minutes of which is active and makes 10 muffins. I actually made two versions of this muffin, one gluten free and one as written. The major change that I made to the recipe was to puree my bananas in my blender before adding them to the wet ingredients. I'm not a fan of lumpy bananas, so this step eliminated that problem. For the topping I let the butter sit at room temperature and then rubbed the warm butter into the sugar mixture with my hands. This allowed for larger chunks of crumb on the muffins, which is what I prefer. My muffins took the entire 20 minutes of baking time to fully set. The tops on these muffins are the best part. The muffins themselves are a little soft, I might suggest switching the butter to canola oil and adding a small amount of cinnamon or nutmeg to the batter. This would help with the flavor and texture of the finished muffins. My youngest son ate the tops off a number of the muffins, since that was his favorite part. The muffins are on the sweet side due to the topping, so if you are looking for a less sweet muffin you might want to leave off the topping. For the recipe go to Banana Crumb Muffins. i'm not a fan of lumpy bananas either...nice call to puree them first! muffin tops are the best part! I agree that the tops are definitely the best part! Bananas give me the wickedest heartburn! These sound awesome, though. Just wanted to say thanks for the comment on my images in blog posts :o) I agree, a food blog without pictures would just be wrong ;o) Then we'd have nothing to drool over like these wonderful banana crumb muffins! Seriously, my mouth is watering and they just happen to be my favorite! I am definitely pinning these to my food board and sharing on Google+! Have an awesome weekend! I am a big fan of banana muffins too, yum! Thanks for the pin and the share :) Have a great weekend! These look really good - great recipe! They really are good, the recipe is definitely a keeper! G'day! What a great way to reuse over ripe bananas, TRUE! 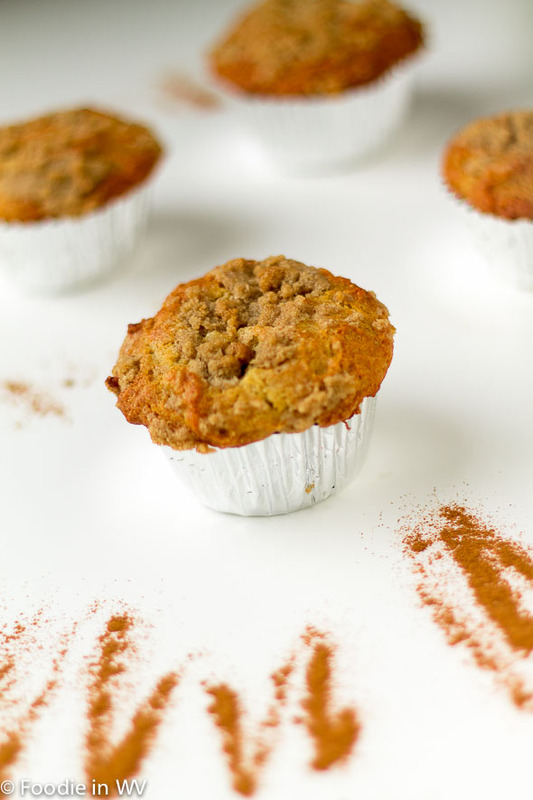 LOVE banana muffins and yes, the tops are always the best part too! I'm a big fan of banana muffins too, they are delicious and the tops are definitely the best part! Huge fan of bananas and usually put one in my protein smoothie with some berries. Now you have me craving muffins late at night! I use bananas and blueberries a lot in my smoothies too. They are a good way to add extra potassium. We are definitely going to be trying these, they look amazing. Thank you for the recipe. Thanks for the sweet comment :) If you try the recipe tell me how they turn out! I am always looking for a new banana muffin recipe to try. My daughter will love these. Thanks for sharing and I wish I had one to nibble now. I love anything with bananas I can't wait to make these. Think I'll add walnuts to the batter for a little crunch. I'm a big fan of bananas also. I like the idea of adding walnuts, they would give the muffins a nice texture! I combine recipes all the time :) I'm glad that it turned out so well!